"A beefy alternative to 'Italian-style' stuffed peppers, great with any white rice-based side dish, or mashed potatoes." Brown beef in a large skillet over medium-high heat. Halfway through browning, add mushrooms and onion. Continue cooking until meat is fully browned; drain fat from skillet. Stir in enough gravy to bond mixture without making it soupy. Season with salt and pepper, and set aside. Meanwhile, heat a medium saucepan of water until boiling. Place peppers in water, and boil for 2 to 3 minutes, until just tender; remove from water. 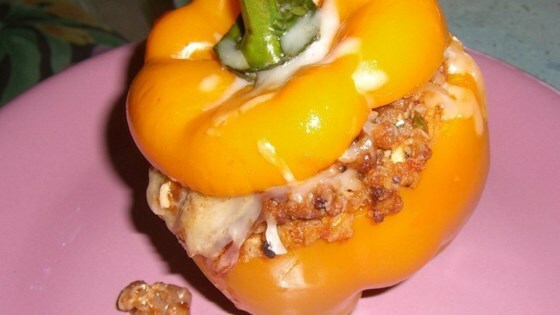 Place peppers, hollow side up, in a 9x13 inch baking dish, and fill each with beef mixture. Bake in preheated oven for 15 to 20 minutes, until bubbling. Top with cheese, and bake for an additional 5 to 10 minutes. Serve in a small pool of gravy. Bland. I would add more seasoning other than salt & pepper. Using a beef gravy I decided to enhance it with a little steak seasoning. It made a great difference! make sure you use all lean meat and low fat cheese, b/c the fat can add up significantly when everything is done. I thought these were really tasty. One thing that I forgot to add was the gravy so I'm sure that would have held the mixture together. I won't forget that again next time; I make these! Great recipe, I added rice in my mixture and it was super.